The Drawing on Joyce sketchbook project will take place live on the streets of Dublin in the run up to the Bloomsday Festival in June. Led by Dublin Sketchers, participants will draw on location in the places that appear in Ulysses. Pubs, chemists and cafés. Parks, martello towers and cemeteries. Taking inspiration from Ulysses – the stories, the characters, the rumour and humour – the project will explore the story of our surroundings, the places we live and people we meet. The sketchbooks will be a record of time and place, now and then. They will reveal Ulysses, one drawing at a time. The Joyce trail sketch crawl will explore James Joyce’s city, real or imagined, through any kind of media and with an exciting range of results. Sunday 11th February 2pm – 4pm: Joyce Tower and Forty Foot in Sandycove exploring the opening chapter of Ulysses. Sunday 11th March noon – 4pm: Sketch crawl from O’Connell Street down Grafton Street, past Davy Byrne’s pub and onto the National Museum. This route follows the course of the Lestrygonians chapter of Ulysses and ends up in the National Library for a discussion of Shakespeare in the Scylla and Charybdis episode. 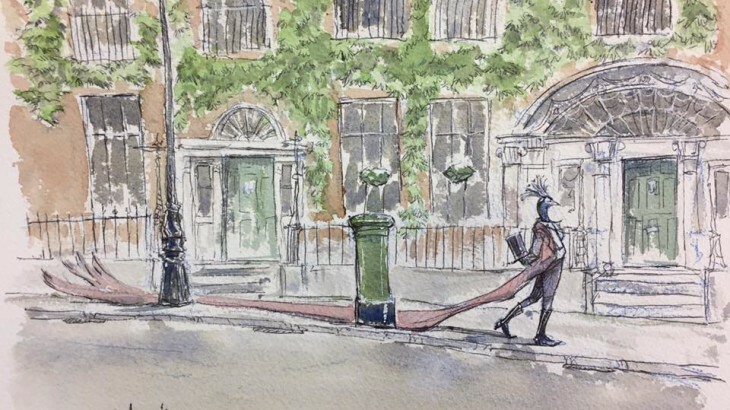 Sunday 8th April noon – 4pm: Sketch crawl from Little Britain Street down to Ormond Quay and across to Merchant’s Arch in Temple Bar, taking in chapters Wandering Rocks, Sirens and Cyclops. Sunday 13th May 2pm – 4pm: Swenys Chemist, St Andrew’s Church and Westland Row for the Lotus Eaters chapter. Sunday 10th June 2pm – 4pm: Eccles Street and North Great George’s Street for a marathon of chapters (Calypso, Ithaca and Penelope). Full details of each Drawing on Joyce sketch crawl will be on the Dublin Sketchers website in the week leading up to the event. There will be extra dates over the 5 months if other locations can be arranged. The sketch books will be exhibited during the Bloomsday Festival. You can follow the development of the project on Twitter @DrawingonJoyce. If you can’t join the sketch crawls in Dublin, then tweet your related sketch during the week of the sketch out. An exhibition at the Olivier Cornet Gallery will also take place during the Bloomsday Festival. It will include artworks by professional artists whom the gallery invited to participate in the Joyce trail sketch crawl events alongside the Dublin Sketchers. The artists will be drawn from various contemporary practices including abstract and non-figurative art. They will chart Dublin, mapping the fabric of the city in order to seek the essence of Joyce’s multi-layered novel. Details will be on the Olivier Cornet Gallery website. Bloomsday, News Bloomsday Box Office, drawing, Joyce, sketching. permalink.